Professor Dawson’s recommended roadmap is based on research into past experiences in IT modernization at the Federal and State level, as well as in industry. Professor Dawson’s recommended roadmap is based on research into past experiences in IT modernization at the Federal and State level, as well as in industry. He draws lessons from his research and extensive case interviews with Federal and State Chief Information Officers (CIOs). Using these lessons, the author frames impediments to modernization and risks for agencies that do not modernize, including continued cybersecurity weaknesses. 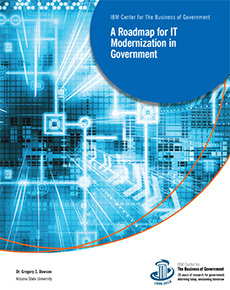 The report uses this framing to develop eight key lessons for government leaders at various stages of IT modernization, and concludes by setting out a roadmap for implementation that agencies can adapt to address these key lessons. This report comes at a timely moment for government modernization at the Federal level, given the recent enactment of the Modernizing Government Technology Act and its Technology Modernization Fund provisions, as well as the IT Modernization strategy being carried out by agencies and led by the General Services Administration, the Office of Management and Budget, and the Office of American Innovation. Professor Dawson provides a resource for agencies to understand how best to develop a modernization business case, establish and implement a change management strategy, and put in place both a long-term initiative and short-term steps that can help agencies measure real progress.